At its heart, the story bears a message about the ongoing conflict between economic and social classes. 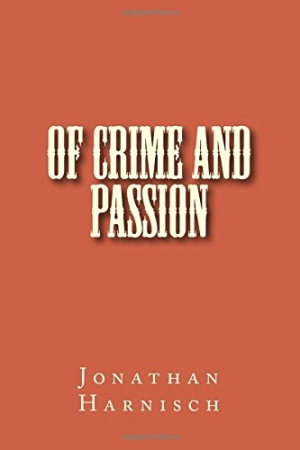 In Of Crime and Passion, the latest novella from Jonathan Harnisch, a proud young man seeks to transcend his underprivileged upbringing by worming his way into the homes of the rich and seducing powerful women. The melodramatic action and old-fashioned dialogue of the book might be more suited to a theatrical production, but there are hints of John Irving in this short morality tale. Thanks to his knowledge of Spanish and the Bible, John avoids factory work and leaves his drunken father behind when he takes a job as a nanny to the family of Mayor Clyde Roman. In this position, and later as a secretary, he undermines the wealthy by seducing a woman of the household. John does not, however, anticipate actually falling in love. Despite his poor background, John is both principled and arrogant. Although we don’t discover the exact origin of it, he has a chip on his shoulder that drives his manipulative actions. John is an enigmatic and fairly nuanced protagonist, but a bit more about his past would help explain his choices. Similarly, the novella never fully explores potential race and class connotations. Chantal reveals that John’s real name is Juan Marcinel, so it appears he could be hiding his Hispanic heritage to get ahead. Flat characters like Mayor Roman, who boasts “men such as myself are born to run this country,” represent the upper classes here, while Che Guevara serves as John’s role model of an underdog working toward revolution. It is unclear why such a short narrative needs to be prefaced with a nine-page synopsis that gives away the story line in a blow-by-blow fashion. There are also odd interpositions that break up the flow, labeled “(Parenthetical Pet Peeve)” or simply “[Smoke Break],” which reads like a stage direction. It is difficult to pin the book’s action down in terms of either place or time, which gives it something of the flavor of an allegory. Although there is a reference to Saddam Hussein, characters also ride in a carriage on one occasion. At its heart, the story bears a message about the ongoing conflict between economic and social classes. With the plot’s traces of Ibsen and Chekhov, it is easy to imagine this coming-of-age tale succeeding in the form of a play.